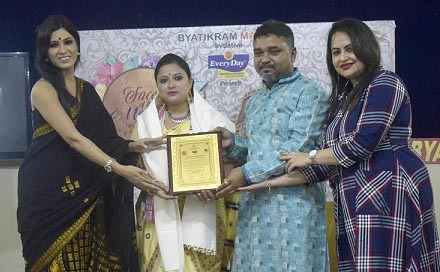 A successful jewellery designer of Assam, Aparajita Das Baruah, was felicitated by Byatikram MASDO in its first-ever session of talk show ‘Face of the month 2018-19’ here on Saturday. The talk show, an initiative of Byatikram MASDO in association with Everyday Salt, was held at Guwahati Press Club. Byatikram MASDO has planned to organize the show every fourth Saturday of the month from August, 2018 to July, 2019 under the Campaign of Respect Womanhood, which will be a one year event. After receiving the felicitation, Das Baruah expressed her happiness after being honoured by the Byatikram Group. She further stated that by taking this step Byatikram has given a platform to women from various fields to showcase their talent. “We the team of Byatikram MASDO is much delighted to share that every year Byatikram has come up with different initiative to highlight or project the potential of the women fraternity from every field,” said Saumen Bhartiya, president, Byatikram MASDO while addressing a press conference at Guwahati Press Club here on Saturday. On June 30, 2018, under the social venture ‘Respect Womanhood”, Byatikram hosted ‘Queen of Northeast 2018’, a beauty pageant, to raise voice for the women. Byatikram offered the women a platform to celebrate their glorious womanhood by tracing their inimitable capabilities within themselves and rejoice themselves being the best one of all. “The pageant was open for all the married women from all over Northeast, where more than 40 contestants have taken part in the show,” said Bhartiya. The jewellery designer also informed that she started a commercial page in the social media to promote Assamese jewelleries and fabrics as one of the first online commercial pages from Assam. “At present, the page has more than 1, 60,000 followers and the number is increasing day by day,” said the designer.